Check out the variety of products we offer to keep your pet's teeth nice and clean. See what customers are saying about our line of products and how they are rating them. Wondering where you can find our products so you can get your pet's teeth clean? Ora-Clens brings you the most effective oral hygiene solutions for your pet. No matter what kind of dog you may have, you'll find a product that is effective in maintaining healthy oral care. Help your pet's mouth get that extra care with ora-clens tartar and plaque wipes. The textured pads make it ideal for removing debris from pet's teeth. When you're short on time, rinse your pet's mouth with oral care rinse. This is an effective solution when you are in a hurry or your pet is reluctant brushing. Or try Oral Hygiene Chews, featuring coated dual enzyme action to help remove plaque and prevent harmful bacteria from building up. 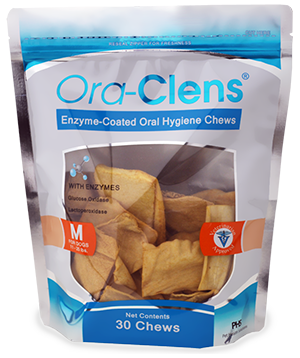 Ora-clens Oral Hygiene Chews formula features a blend of the enzymes Lactoperoxidase and Glucose Oxidase, which help prevent plaque and tartar build up as well as promote clean teeth and fresh breath. With the enzymes coated onto the chews, your dog will gain faster benefit. Oral Hygiene Chews also feature an abrasive texture, which help scrub your dog's teeth while he chews. Maintaining your dog's oral health is an important part to maintaining your dog's overall health. Feeding your dog an Oral Hygiene Chew as a treat is the easiest part of the oral care process. Dogs love the delicious poultry flavor! Try Oral Hygiene Chews with other Ora-Clens products to optimize oral health. Beef Hide, Dextrose, Poultry Digest, Hydrolyzed Vegetable Protein, Primary Dried Yeast, Potassium Sorbate, Glucose Oxidase (Aspergillus Niger), Dried Whey Protein Concentrate. An effective, safe and palatable, fresh antimicrobial formula for reducing plaque and freshening breath in dogs and cats. Contains antimicrobial, anti-plaque and anti-calculus properties to aid in tooth and gum disease prevention. When you can't brush, flush with Ora-Clens! Brushing your pet's teeth is important but if you're short on time or your pet just won't allow it, Ora-Clens dental rinse is great for getting rid of the bad breath and helping to prevent dental disease. Sorbitrol, 0.13% Chlorhexidine Gluconate, Zinc Acetate, 0.05% Cetylpyridinium Chloride, Flavor. An effective and safe dental solution with antimicrobial activities reducing the plaque, dental calculus and tartar buildup on pet's teeth over time. Ora-Clens also reduces bacteria that cause bad breath. 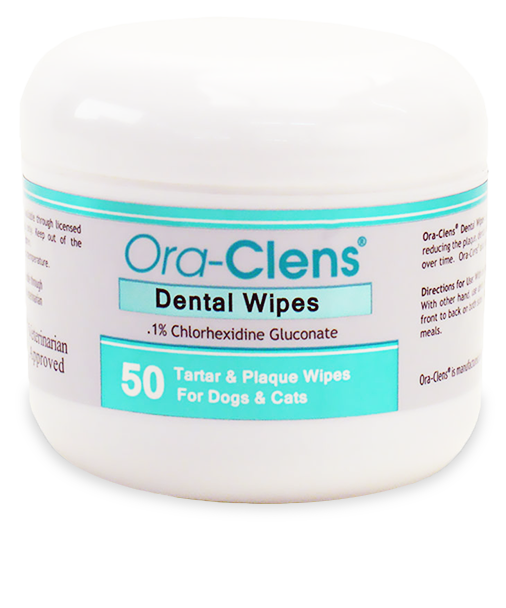 Ora-Clens Dental wipes pads are specially textured to assist in removing debris from pet's teeth. It's also great for removing plaque and tartar leaving pet's teeth clean and polished! 1% Chlorhexidine Gluconate - This active ingredient is an effective antiseptic, helps to reduce dental plaque and oral bacteria which causes bad breath. 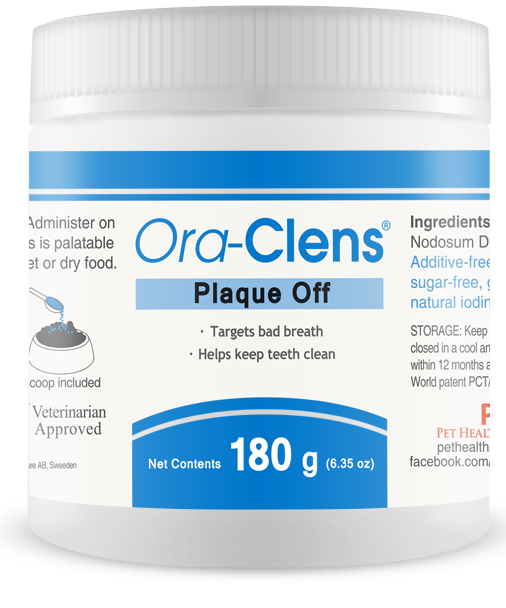 Ora-Clens Plaque Off works to fight the bacteria that produce plaque, tartar and bad breath in cats and dogs. Plaque and tartar can cause gum disease, tooth decay and other dental problems. This product uses natural ingredients to prevent these diseases at their source with a formula that contains no sugar, preservatives or gluten. Ora-Clens Plaque Off is simple to administer to your pet- simply mix a small dosage of powder into your dog's wet or dry food. You'll love how well this product reduces your pet's bad breath and keeps her teeth and gums healthy, so order a bottle today! PHS Ora-Clens Dual Ended Toothbrush makes home dental care easy for owners and works for pets of all breeds and sizes. Each end features a brush that is a different size to ensure that dogs of all sizes have an appropriate brush. The toothbrush is also long and slender to ensure that it easily reaches even the farthest molars in your dogs mouth without causing you or your dog undue discomfort. PHS Ora-Clens Dental Gel Toothpaste works to freshen breath and gently clean your pet's teeth and gums. This enzymatic toothpaste uses ingredients to catalyze the effects of the baking soda solution to kill bacteria that can lead to dental disease. The dental gel also features a delightful mint flavor to provide a pleasing taste to your pet while brushing and to freshen breath. The gel is also safe for cats and dogs of all sizes. Ora-Cleans Dental Gel Toothpaste is ideal for multiple pet households that need regular home dental care for each pet. Each package of the dental gel comes with 4 ounces of toothpaste that should be applied with a toothbrush. Water, Propylene, Glycol, Glycerine, Pyrogenic Silica, Sodium, Carboxymethylcellulose, Polysorbate 80, Glucose & Lactoperoxidase & Glucose Oxidase, Mentha Piperita (Peppermint) Oil, Mentha Spicata (Spearmint) Oil, Sodium Bicarbonate (baking soda), Methylparaben, Polyparaben, Blue #1, Yellow #5. Great product, safe, mild & gentle and helps fight gum disease and the bad breath that is caused by it. Our Dachshund came to us with really bad gum disease and missing teeth. After his teeth were cleaned, we began using this product every other day along with brushing and Plaque Off in his food. After just 6 months of use, I am happy to learn from our vet that our Dachshund is now growing new gum tissue and there's no sign of tartar! Can't beat the price either! I use Ora-Clens after brushing our dog's teeth. They are both 4½ years old and have yet to have their teeth cleaned at the vets! I have a new small dog who was fighting the toothbrush. It was too big for her mouth and she just didn't like it. The wipes were easy to use and she didn't fight me when I used them. It's been over a month now and she still doesn't mind me using them. This is a good product to use in between brushing. My cat seems to tolerate it and it does clean his teeth. Dental wipes are a great addition to teeth brushing. They are easy to use and don't require as much time as brushing. I alternate between the two. I usually use the wipes just before bed to clean excess food and plaque that has accumulated during the day. The Chlorhexidine Gluconate is also antiseptic and helps with bad breath. We have three Golden Retrievers who absolutely love these chews. The Ora-Clens chews help keep their teeth cleaned and are thick enough to where the dogs do not choke on them. My dogs love them. What I like about these chews is that they are not messy and they don't cause any stomach problems for them. My dog loves these. These are actually the perfect size for my 75lb shepherd/retriever mix as well. The price is reasonable, too, as compared with the product cost at my vet's office for a different brand. I am really pleased with this toothpaste, all of our dogs enjoy the flavor & leaves all of there mouths nice and minty clean & smelling.. Founded in 1997, Healthypets, Inc. mission is to help pet owners improve and care for their pets without having to spend a great deal of money. We are dedicated to helping and strengthening the bond between humans and animals. As your one-stop pet shop, NaturalPets.com provides affordable solutions to give your pet the healthiest and happiest life possible while saving you money. Basically, we aim to keep your pets' tails wagging!